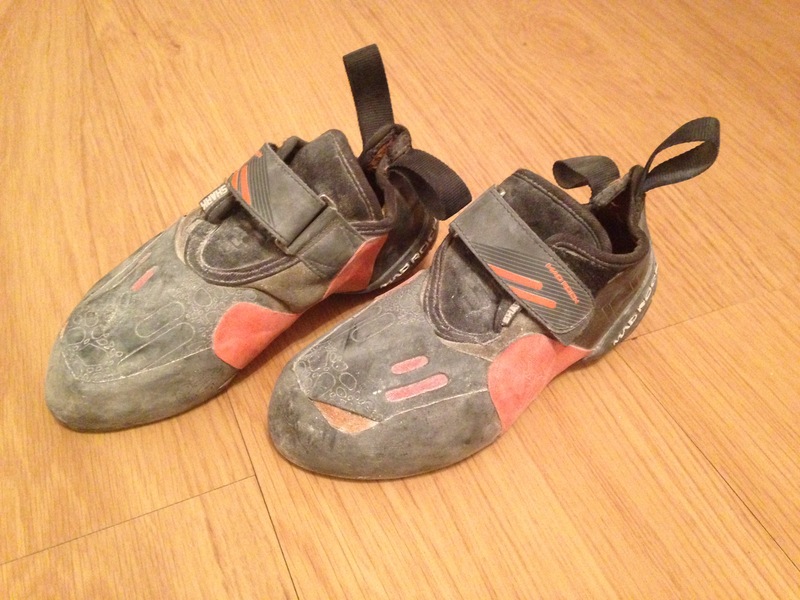 I’ve had my Anasazi LV boots for about four to five months, and they have been the shoes I unconsciously reach for every time I hit the climbing gym. I literally put them on and get on with my climbs, and for this reason I guess I didn’t appreciate how good they were until I actually realised I wasn’t thinking about them. Also If they’re good enough for notable professional climber Shauna Coxey, then I think it’s fair to say they’re a damn good shoe. Fit – Internet research told me that for a bouldering fit I should downsize by half or a whole size. 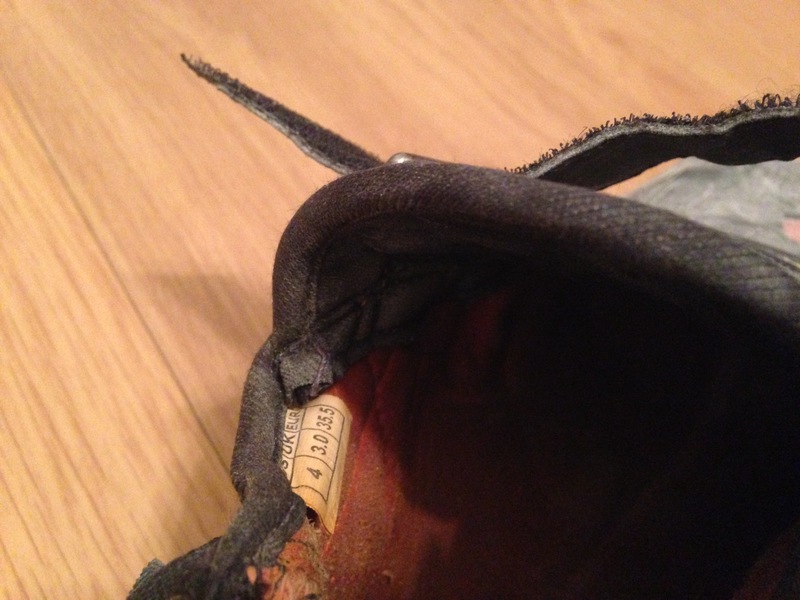 After making a trip into my local Cotswolds and trying them on, I discovered I couldn’t get my foot in the 2.0 (UK), and the 2.5 (UK) were far too tight to the point where I couldn’t even fasten the Velcro straps. I think this is due to my feet being wide for their size, and more mid-volume than low. However the 3 (UK) fits perfect with the right amount of toe pressure and heel tightness, so I ended up matching my street shoe size. Getting them on and off is easy enough and they seemed to break in quickly, generally they’re a particularly comfortable climbing shoe. Specifications – For a long time I was under the impression that if it wasn’t down turned, severely asymmetric with a split sole, then it wasn’t a technical shoe. How wrong I was! The asymmetric toe box and slingshot heel give the power, whilst the stiff last offers support as it is one solid piece. The fact that they are comfortable too just adds to their quality, I can wear these shoes for long stretches without having to take them off. The only small nag I have is that I wish there was a little more toe rubber, just to make a toe hook feel more secure and painless. Performance – Slab, roof or arête, I don’t think there is a problem within my ability range that I couldn’t conquer in these boots. For me, that is what a performance shoe should offer. The Stealth C4 rubber is so hard wearing and yet so sticky. They make short work of tiny edges, rounded volumes and smearing in these babies is a dream. 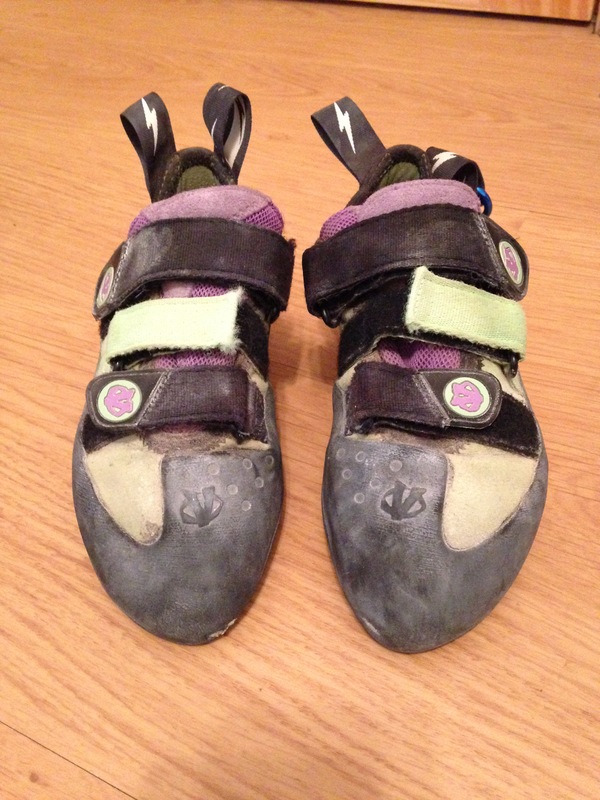 I found that because I trust the rubber on the Anasazi LV boots, I’m more likely to flag and use the edges of the shoes, which has helped me progress my climbing skills. Aesthetic –I like how understated they are visually, and how powerful they feel to climb in. They are a lovely teal colour which I think is fairly gender neutral, plus I do like the cool, little cross-hair design on the toes too. The Five Ten Anasazi LV are currently my favourite shoe, they have taken over and become the only climbing boots I reach for, no matter the problem. These shoes offer solid power and confident climbing, all with the added benefit of comfort. When I eventually hit the outdoors, this will be in my bag for sure. 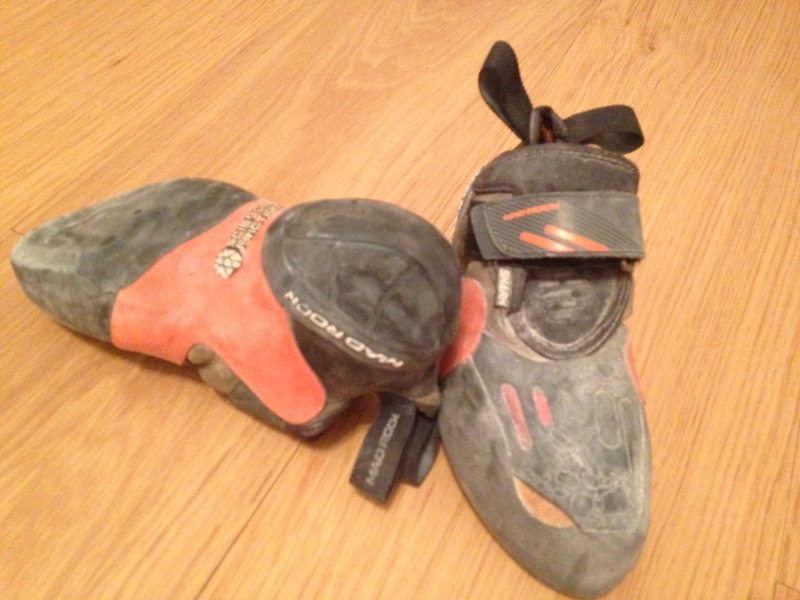 The Evolv Elektra were my first pair of climbing shoes, they remind me of good times and happy memories! 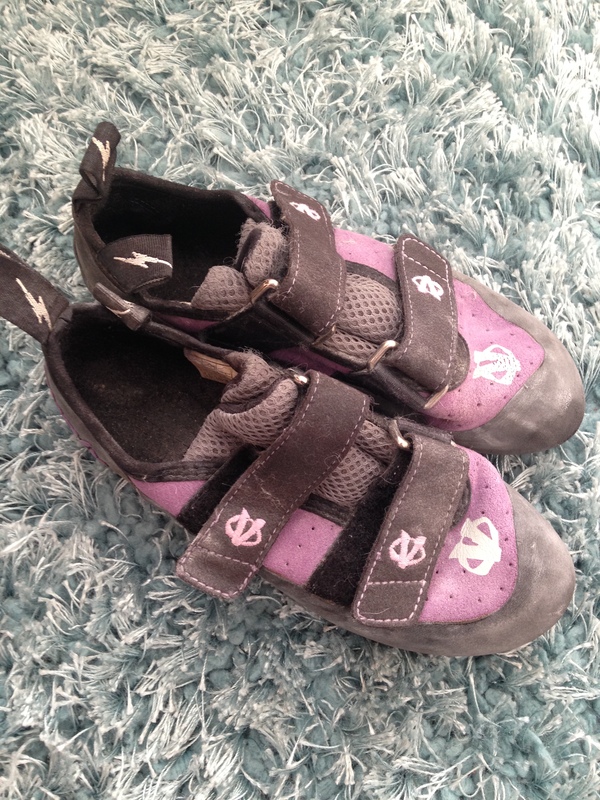 Lots of holds were stood on in these little purple boots, and many a fall taken. 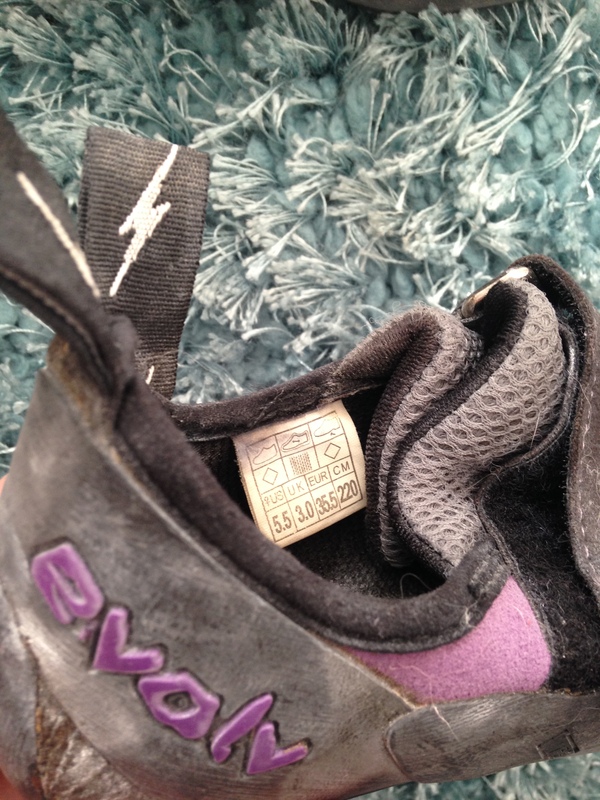 I only ever wore them indoor bouldering, but they were a great newbie shoe. I know there are plenty of reviews out in cyberspace already, but I thought I would throw my views into the mix too, as they’re a great starter shoe. I’ve also done a post on buying your first pair of shoes which you can read here, but anyway on with the review. Fit – I’m a st reet size 3 (UK) and size matched as most people do in Evolv. I found that they did stretch a little after breaking in and became more comfortable for a long climbing session, but still had a snug fit. 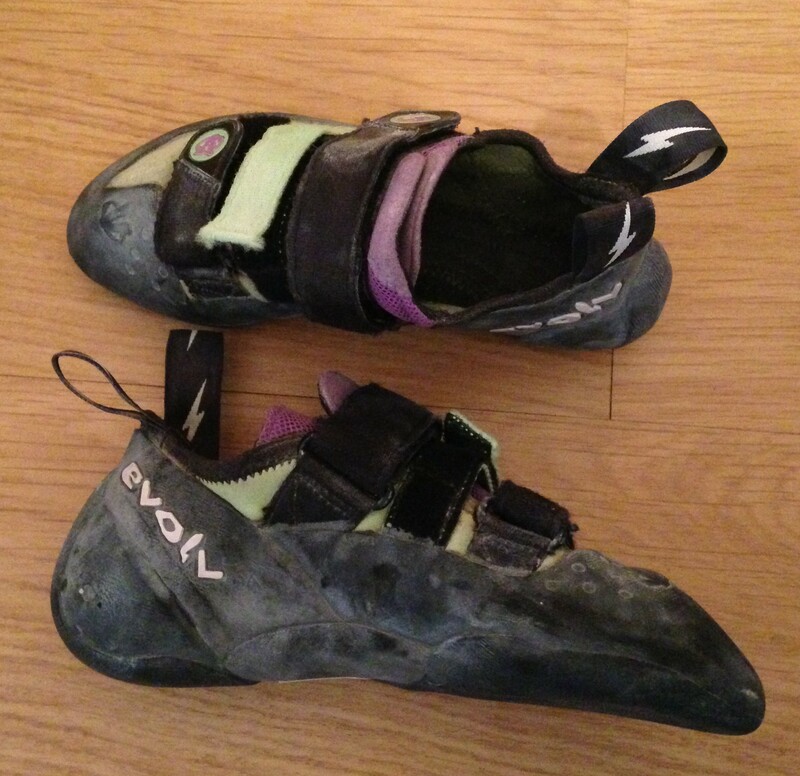 Specifications – They are an asymmetric shoe which gives a new climber the feel of what a technical climbing shoe should feel like without being horrendously painful. The extra toe rubber is awesome too as a lot of toe dragging can happen as a newbie, so this extra thickness means your shoes are likely to last longer. They come in both lace and Velcro, I went with Velcro because I like the speed I can whizz the shoes on and off, plus after experiencing post climbing hand pains I figured this would be the nicest option. Ain’t nobody got time for laces with sore finger tips! Performance – The rubber is Trax ( I believe) which is sticky and feels safe, especially when smearing. However the toe comes to a very thick point which takes away any feedback you could get from the holds, causing the shoe to lack sensitivity at times. They’re okay for heel and toe hooks, but not the best. However that could be seen as a little irrelevant for a beginner, as it’s unlikely you’ll be doing such demanding moves so soon anyway. I think these are a common option for beginners with the price point, (I paid around £45 in Go Outdoors) and also because they are a very good, all round beginner shoe. Originally aimed at the female market they’ve recently been redesigned with more gender neutral colours (teal and grey), this makes them more suitable for all you guys out there with low volume feet. Overall my personal experience with them has been great, the only downside has been the smell they can emit, something Evolv shoes are notorious for. Typically you don’t wear socks with your climbing shoes, so you can feel the sensitivity of holds, and after climbing hard in synthetic fabrics it’s likely to cause sweaty feet and smelly shoes! Don’t be put off, as this is easily fixed by using a shoe or foot spray. I like to use Boot Bananas as they are amazingly good at neutralising odours.